If there’s one thing my mama taught me, it was to love good Southern food. There are so many foods that we in the American South claim as our own…some of them, many northern folks haven’t even tried. That’s ok, of course, as they have their specialties, too; regional cooking is wonderful. 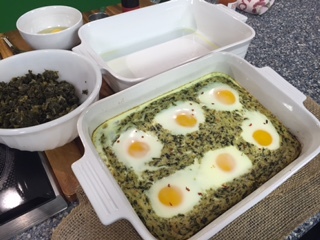 To combine greens with the grits I love so much, I created this casserole so they could play together nicely. This casserole marries some of the South’s favorite ingredients: greens, grits, and eggs. 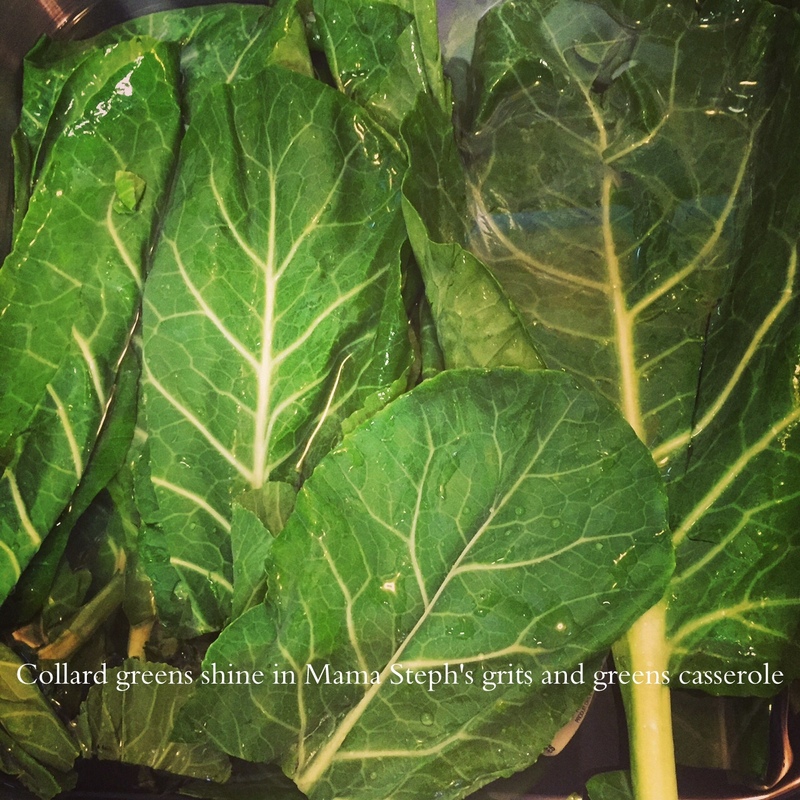 It is perfect any time of day, and is a great way to use up leftover cooked greens. Bring water to boil; add grits and salt, whisking constantly. Drop heat to low, and cover, stirring occasionally. Cook according to package directions, which for Old Fashioned style grits should be about 12 minutes, or until thickened. Add 1 cup of shredded cheddar cheese (I used sharp white cheddar) to grits, and stir until completely melted. Mix well, and then add to cheese grits mixture. Next, add two to three cups cooked, drained greens (collard, turnip, mustard, spinach, etc.). Stir into grits until well-distributed. Spread mixture into greased or sprayed 9×13 baking dish. Remove casserole after 25-30 minutes, or until firm in center. Use a serving spoon to make 6 or 7 indentions in top of grits casserole. Crack a whole egg into a cup, then gently drop one egg into each indention. Return to oven for 12 minutes or until eggs look done enough for your taste…longer for firm eggs, shorter for runnier eggs. Serve with a sprinkling of hot sauce and shredded cheese, if desired. Enjoy! I’m a Northerner and a Westerner who loves Southern FOOD. YAY! Hi, Sarah. 🙂 Can’t wait to check out your site!